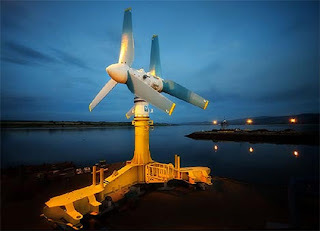 A device thought to be the largest tidal turbine of its type to be built in the world has been described by its developer as "simple and robust". Atlantis Resources unveiled its AK-1000 at Invergordon ahead of it being shipped to a European Marine Energy Centre test site off Eday, Orkney. Chief executive Tim Cornelius said it was designed to survive in a harsh marine environment. The device stands 22.5m (73ft) tall and weighs 1,300 tonnes. The turbine took Atlantis Resources Corp. $7.5 million and a decade to complete. It has two sets of blades on a single unit to harness ebb and flood tides and could generate one megawatt of power - enough electricity for about 1,000 homes. Atlantis said it was the largest bladed turbine of its type because of its rotor diameter of 18m (59ft). Mr Cornelius said that the focus of the marine industry at the moment was making the Pentland Firth a huge success in terms of generating electricity from renewable energy devices. The Crown Estate has selected developers to start the process. Mr Cornelius said: "It is one of the harshest environments on the planet. "In order to get a robust turbine we have had to make what we call ultimately the dumbest, simple but most robust turbine you could possibly put in such a harsh environment." Following final assembly at a yard in Evanton, the AK-1000 has been moved to nearby docks at Invergordon on the Cromarty Firth. Atlantis, which has bases in London and Singapore, has been leading a plan to use tidal energy to power a computer data centre in the far north of Scotland. Earlier this year, the corporation said it remained committed to the project. The computer data centre would provide services for a number of companies and be powered by tidal energy rather than depend on electricity supplied to the National Grid. Atlantis did not apply for the first round of leases for renewable energy sites in the Pentland Firth that were granted by the Crown Estate in March. But Mr Cornelius said the company proposed bidding when other locations were made available. Two years of planning have gone into the data facility and tidal scheme. The Crown Estate leased 10 sites on the seabed around Orkney and the Pentland Firth to seven companies.